Home › Content design › Content design: what is it and how do you do it? Sometimes it’s hard to keep up with all the jargon in the world of digital media. Content may still be king but there are lots of different ways of looking at it. We’ve had content strategy, we’ve had content marketing and now there’s a new kid on the block: content design. Well, it’s not that new (we’ll come to the history in a minute), but the concept is fast becoming better known. That is partly down to Sarah Richards, who led the content design team at the Government Digital Service (GDS) and has now written a book for the rest of us. Simply called Content Design, it’s a valuable handbook for people who used to call themselves web editors, writers or, indeed, content strategists: concise, practical and likely to join the “must-have” list for your bookshelf. Sarah’s team at the GDS invented the concept of content design between 2010 and 2014 as part of the huge GOV.UK project – moving 400 different government websites into a single user-friendly site. The site is a great example of content that starts with what the user wants to know (rather than what the organisation wants to tell them)– something that is, sadly, often overlooked by website creators. 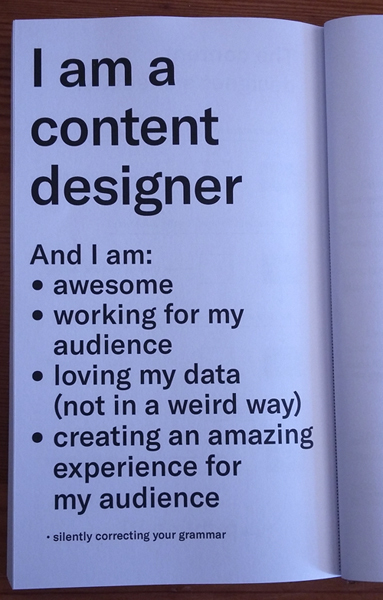 So how is content design different? In a nutshell, it’s identifying what your users need from your website (through research, not guesswork), then thinking about the content that will best meet that need. This might not necessarily (or exclusively) be words, hence the use of “design” rather than “writing”. What comes across in the book is that firstly, it’s a way of thinking: user-first. And secondly, it’s a way of working: collaboratively. The book outlines some tools and techniques to make this happen in real life. A huge amount is about preparation and planning. Only when you’ve pinned down your “user stories” and “job stories” (what people want to achieve on your website in particular roles or situations) do you actually start creating content. While there is a lot of crossover with how web writers/editors usually work, there is one major difference. The writer does not work alone. That probably sounds scary, but it makes practical sense. It’s about pooling knowledge, making decisions more quickly and cutting down the traditional to-and-fro, us-and-them processes. The book has practical advice on techniques to make this work, from team-wide “content discovery and research” sessions to pair writing and “crits” (critiques). The idea is that you get fewer rewrites, faster sign-off and valuable input from others early in the process (as well as fewer disgruntled colleagues). And, Sarah promises, “because of you, the internet is getting better”.